The Wedgewood Heights Edmonton real estate average sale price per square foot has been under the overall Edmonton average since the 3rd quarter of 2010. 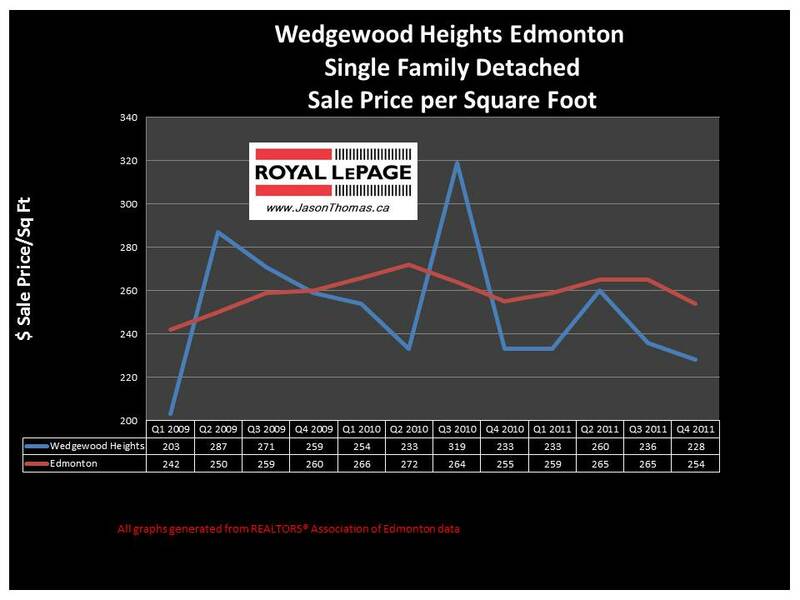 Wedgewood Heights tends to sell about $25 per square foot less than the Edmonton average. Wedgewood Heights is a popular area, and I am a little surprised to see the sale price per square foot struggle this past year. The average time to sell a home in Wedgewood Heights was 71 days, which also is longer than the Edmonton average days on market of 54 days. The highest sale price recorded in Wedgewood Heights this last quarter was $587,500 and that was also the highest price for 2011. Click here if you are interested in finding out what your Wedgewood Heights Edmonton home is valued at in todays real estate market.